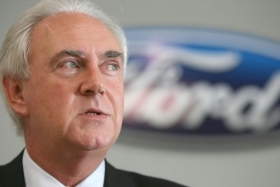 Ford of Europe President John Fleming is concerned about the automaker's future in Russia. ROME -- Ford of Europe's boss fears the company's business in Russia will be hurt if rival General Motors Co. decides to sell a majority stake in its Opel brand to Magna International Inc. and its partner, state-controlled Russian lender Sberbank. “I look at (the Opel-Magna deal) from a perspective of how it will affect us, and I see it as a risk for us when I look at the likes of Russia,” Ford of Europe President John Fleming told reporters here on October 27. A key part of the Magna-Sberbank's future plan for Opel is to make it a powerhouse in Russia. To do that, the partners plan to form an industrial partnership with Russia's second-largest automaker, GAZ. Through nine months, GAZ, the maker of the Volga brand, sold 42,568 units in Russia while Opel's volume was 29,629 units, according to the Association of European Businesses. Ford, Russia's third-largest automaker and second-largest foreign brand, had sales of 64,943 units from January to September. Ford has a strong foothold in Russia. It has produced the Ford Focus, the country's No. 5 selling car, in St. Petersburg since 2002. However, Russian leaders have been looking for ways to strengthen the country's domestic automaking capabilities. They consider the Opel deal a big step toward achieving the much-needed modernization. Ford already has seen many of its rivals benefit from government support this year. • PSA/Peugeot-Citroen SA and Renault SA each received 3 billion euros loans from the French government. • Opel got 1.5 billion from the German government in the spring and is in line to get another 4.5 billion if the Magna deal goes through. • GM was supported by billions from the U.S. government to prevent its collapse. Ford did not get anything.